There are really only two ways to make more money. One, you can spend less. Two, you can make more. Personally, I’m a fan of making more money. I would rather earn more money and have more to spend than always be denying myself things I want. In our lifetime many of us have been confronted head-on with having to figure out a way to spend less money. In school, you learn how to set and live off budgets. But what if you thought about money differently? What if instead of focusing on how to cut back, you focused on how to make more? There are many possibilities to do so. The first step in making more money is to decide how much more you want to make. FREE WEBCAST: Discover how you can earn money by training others. What does your employer, your customers, or the world need that you could provide? Once you’ve identified that, it’s time to develop and deliver that product, service, or extra value. Today, many of America’s biggest and smartest companies are cultivating entrepreneurship amongst their employees and executives. Companies such as Google encourage their employees to spend up to 20% of their work week to pursue projects of their choice. They are encouraged to “think outside the box” and come up with new ideas and innovations. Intrapreneurs are the ones who created the Post-It note for 3M, the Java programming language for Sun Microsystems, and even Yahoo’s Search offering. Does your company have customers it isn’t selling additional goods to? Maybe there’s a piece of machinery, a vendor relationship, or an overlooked marketing idea that your employer isn’t taking full advantage of. Can you create a plan to turn this asset into cash? Approach your employer with a proposal to work on an asset-maximizing project off-hours for extra pay. This could even garner you a well-deserved promotion. Many of the most successful people throughout history have identified a need in the marketplace and provided a solution for it. If you want to earn more money, identify a need that isn’t being met and determine how to meet it. Have you seen ABC’s hit show The Shark Tank? A panel of five investors listens to pitches for some of the best business and product ideas from some of America’s brightest entrepreneurs. The ideas come from stay-at-home moms and dads to students, to people who want to be their own boss. They present innovative ideas covering children’s products, music, sports, cars, and even the nightclub scene. Though some of the ideas are kooky (hey, it is television, after all!) there are also a handful of brilliant ideas coming from people who have found a need and filled it. On a recent episode, two ambitious college students created a successful “coffee of the month” business. They realized there was a market for people looking to sample coffee from around the world. In turn, they capitalized on that using a subscription-based model. They found a need and filled it. They received the capital to start their company with a successful Kickstarter Campaign and have now solidified themselves as coffee connoisseurs with a taste for unique blends found all around the world. Their company is a “wine of the month” club for coffee lovers. There are always needs you can find to create a business or service around you. Many of these former “met needs” are inventions and services we now take for granted. The fact remains that people discovered something needed in their own life, or others’, then created the gadgets and services we enjoy today. When Dave Liniger, founder, and CEO of RE/MAX, was a successful young real estate agent, he grumbled about paying 50% of his commissions to the broker whose office he worked in. As an out-of-the-box thinker be began to look for a better way to sell homes and keep more of what he earned at the same time. He could have rented a desk in an office building for $500 a month. But, that didn’t offer outstanding management, a large brand name, lots of offices, or the ability to share expenses across thousands of agents. He thought, why not create a hybrid? A firm that offers more independence to agents and lets them keep more than 50% of their sales commissions. But, still, provides more support than going at it alone. And from that, RE/MAX was born and is now one of the largest networks of real estate agents in the world. Liniger’s out-of-the-box idea was backed up with hard work, perseverance, and passion, and it met a need for thousands of real estate agents. His dream has grown into a billion-dollar-a-year business. How far might you go if you were willing to do some out-of-the-box thinking? Today, an internet business is one of the fastest and easiest ways to get started, even while keeping your current job. You can find a need and fill it for thousands of people with that interest across the world. If you are creative and artsy, Etsy.com is a fast-growing e-commerce website where people can sell photography, artwork, jewelry, quilts, knick-knacks, and toys to people all across the world. If you have great information to share with others, you can sell e-books, audio files, training materials, how-to courses, and other informational products online easily, without needing to ship a single box. Website platforms like WordPress.com make it easy to have a website up and running in no time. If you have clothing or items around the house that you are no longer using, start a small business and sell them through Ebay.com. If you enjoy bargain shopping, I know a woman who made her entire living off of purchasing children’s clothing and toys from discount stores and selling them on eBay to make a profit. You don’t need to have a big marketing machine behind you to successfully sell through the internet. Hundreds of websites, blogs, newsletters, and clubs already have visitors, subscribers, and members who could be perfect prospective customers for you. Talk to the site or blog owners and offer them a percentage of anything you sell to their readers or members. This becomes a win-win for everyone involved. There are more than 1,000 companies who sell their products and services through network marketing and direct sales. From health and nutritional products to cosmetics, cookware, toys, educational materials, and phone services there is something for everyone! I’ve been a consumer, representative, and trainer to many great companies. Companies who not only have amazing products to offer but great compensation plans and training programs to support you. There is an unlimited opportunity for growth and compensation. Find a company that has been around for a while and has a good reputation. Try the products and make sure you love them. If you are passionate about the products and the people, you can earn more money through the leverage that building a downline provides you. Just remember, wherever you decide to put your energy, the key is to become more valuable to your current employer, customer, or clients. You can do this by getting better at solving their problems, delivering products, and adding services that they want and need. Make it a part of your vision and your goals. Visualize and affirm that you earn more money from your ideas because they provide value to others. Start reading books and articles about it and talking with your friends about it. You will start attracting all kinds of opportunities and ideas. Then, act on the ones that feel most right for you. You will earn more money in no time. Are you good at teaching others how to do something? Or leading groups? Would you be interested in teaching my Success Principles to others to make more money? Could you teach seminars locally? Can you offer a class at the local high school or community college? Could you lead a workgroup at the office to incorporate these principles on the job or in your department? Or could you boost your existing career as a professional trainer? 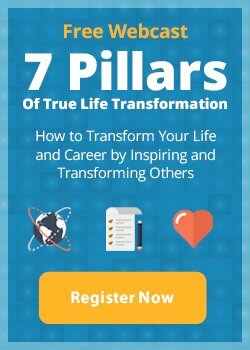 If you can envision yourself as a dynamic and powerful presenter you should watch my free webinar The 7 Pillars of True Life Transformation. In it, I’ll show you how you can transform your life and your career, by training others. You don’t have to be a master of implementing these principles to lead a group, since I’ll help you become a master trainer as part of this immersive professional program. Imagine the workgroups, clubs, sales teams, women’s groups, entrepreneurs, or companies where people could be working together to support each other in actively living these principles. The results would be miraculous. And YOU can be the person that makes that happen. Click the button below to learn more.